Tokyo, Japan – March 29, 2016 – LINE Corporation announces that it has introduced “Choco,” a new official LINE character appearing in LINE stickers. The LINE characters were created along with the release of LINE stickers on October 4, 2011, and ever since the expressiveness and unique personalities of Brown, Cony, Moon and the other LINE characters have struck a chord with LINE users across genders and age groups. These characters have evolved to become a defining symbol of LINE, now appearing in various LINE-related services and collaborations with other corporations and brands. Meanwhile, the LINE FRIENDS STORE, an officially licensed character goods store that opened its first shop in 2013, has expanded to 44 locations in 11 countries. From Harajuku to New York and Shanghai, the LINE FRIENDS STORE is an important touchpoint between LINE and its users. As LINE prepares to celebrate its fifth anniversary since service launch, it will introduce a new LINE character, Brown’s little sister “Choco.” A dedicated webpage introducing the character has also been launched today. Choco stickers and LINE FRIENDS STORE goods are scheduled to be released in the near future. Choco is meant to represent social media-savvy, highly fashion-conscious young women who are always up on the latest trends. Choco is constantly on the lookout for chic new fashion items and has always got a new look ready to show off to users. 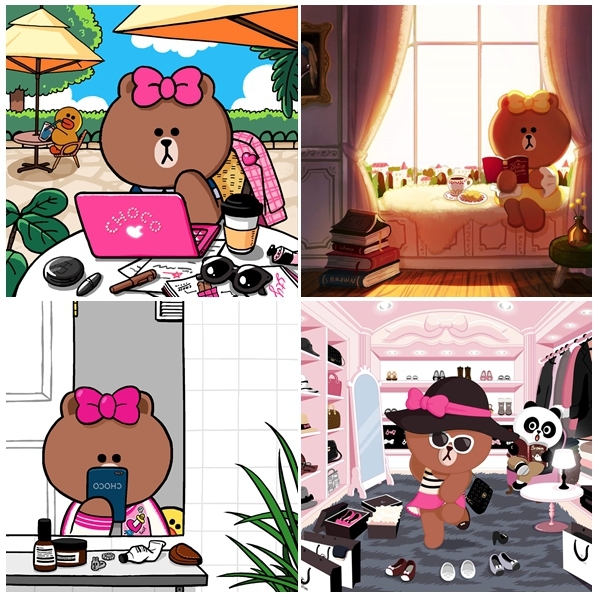 LINE will promote Choco in a new way that no other previous LINE character has been featured: Choco’s daily fashion will be shared via Instagram and other social media services and users will be able to interact directly with Choco herself. LINE will continue to use its LINE characters to strengthen its appeal to and connection with LINE users and　children around the world.